Gold, platinum and palladium finished higher Tuesday and silver was unchanged. Palladium marked another settlement record. Gold for April delivery climbed $2.10, or 0.2%, to settle at $1,314 an ounce on the Comex division of the New York Mercantile Exchange. "Gold is likely to be quiet for the remainder of the week pending news on the U.S.-China trade talks, and the U.S. government shutdown," Reuters quoted Bob Haberkorn, senior market strategist at RJO Futures. "If there is an announcement that the government is going to be open and if there’s a breakthrough in trade talks, gold will initially sell off, but traders want to own gold right now with the U.S. Federal Reserve being dovish." Gold futures ranged from a low of $1,310 to a high of $1,318.30. They shed 0.5% on Monday. Elsewhere, silver for March delivery was unchanged at $15.69 an ounce. Silver futures traded between $15.65 and $15.82. They declined 0.8% on Monday. April platinum rose $3, or 0.4%, to $789.60 an ounce, ranging from $785.50 to $794.80. 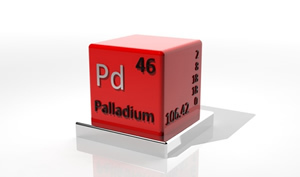 Palladium for March delivery tacked on $18.60, or 1.4%, to $1,375.40 an ounce — an all-time high close. Palladium prices trading between $1,355.80 and $1,379.50. Gold added $3.60, or 0.3%, to $1,310 an ounce. Silver added 10.5 cents, or 0.7%, to $15.81 an ounce.